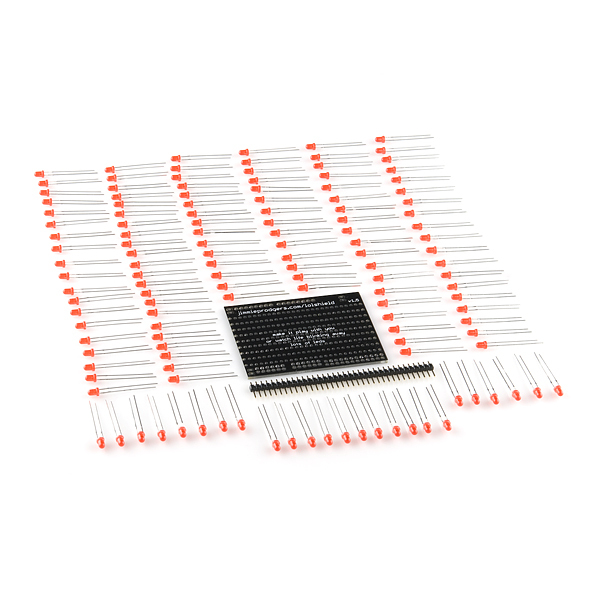 What Arduino should i buy for this? Thanks in advance. JimmiePRodgers site is apparently dead... and has been scooped up by a squatter. would it be possible to order the board with out the green or red LEDs? I would like to swap them with warm (natural) white super bright 5mm LEDs. unfortunately not. It comes with the LEDs. But it is a kit, so you can just use them for something else down the road. Does anyone know what the specs are for the LEDs? 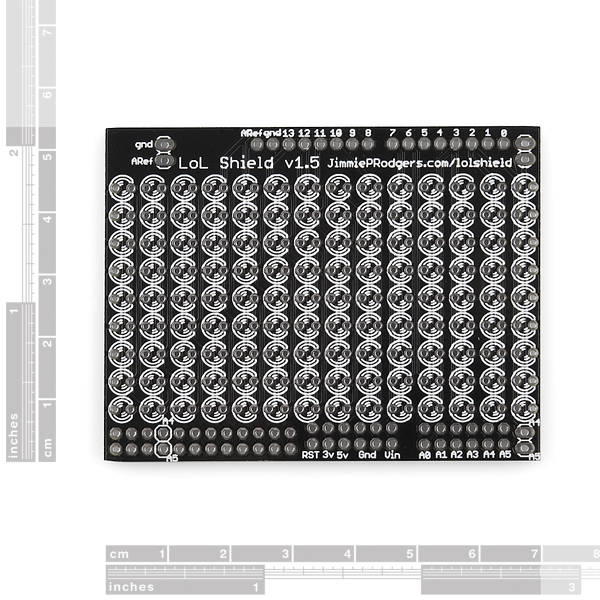 I ask because I came across a used LoL Shield and its missing a couple of LEDs. Designer's instructions have you solder one pin of each LED in a column, then reflow each one while pushing the LED flat to the board. I can't see well enough & didn't have a fine enough tip on the iron to risk hitting each one 3x (2x on one pin plus 1x on the other). I came up with a way to hold them in after dropping them in with the PCB component-side-up so they'd be flat with the PCB component-side-down for soldering documented here. Be careful when you buy this. It is only compatable with the arduino pro. 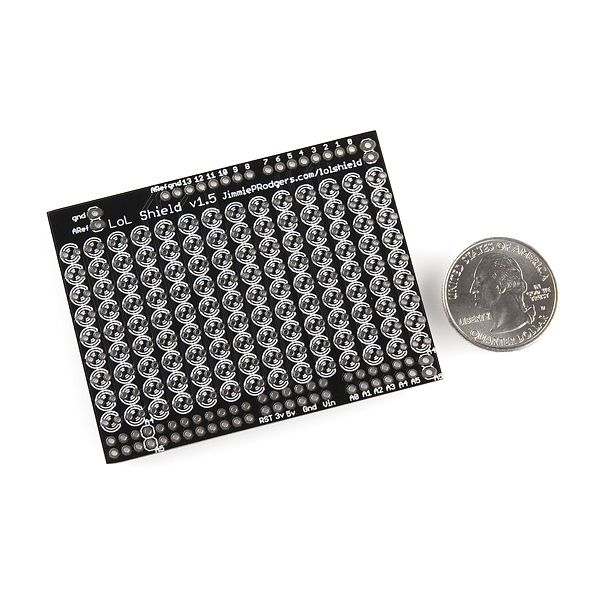 On any of the units that have a USB connector the housing of the connector will contact the bottom of the board shorting out several rows of LEDs potentially damaging the arduino. And it is not pin compatible with the arduino blue tooth as the power pins are re arranged. 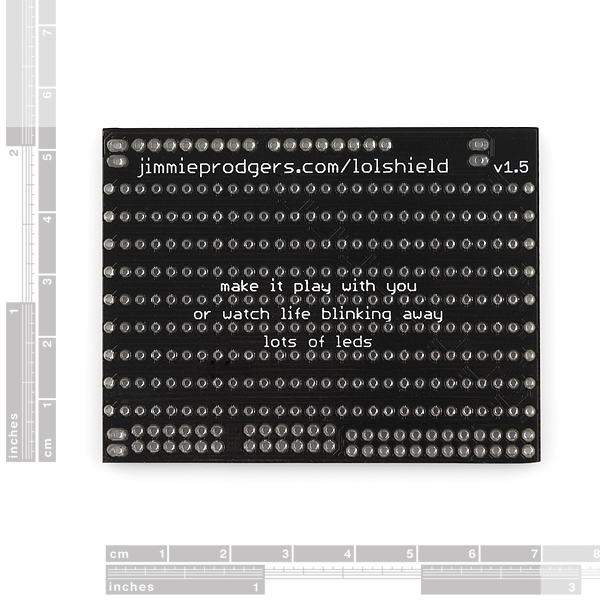 The lol board does not appear to actualy use these pins so it might work anyway but I wouldn't risk it. A trick many have found out. A piece of electrical tape on the USB connector solves these issues. Many shields will short otherwise. Arduino should switch to miniUSB. The link to the spread sheet on Google Docs says I do not have permissions to access the document. An aptly named product (LOL). I guess Arduino guys don't need schematics, eh? If you want to be "gnarly, dude" try the "ODS file here" link (it's a broken link).